My daughter is a little disappointed today when her first artwork sale didn’t materialize. A buyer from Seattle was supposed to buy a digital drawing but didn’t pursue the transaction because of the exorbitant shipping fee. The artwork is just a size of a bond paper but the courier company rate is P1,330 (around $27). I told my daughter there will always be a next time. With the present shipping rate I wouldn’t be surprised if the amount for sending a musiciansfriend.com guitar amp overseas is expensive as well. This entry was posted in Art, Music, Personal and tagged artwork, artwork buyer, failed artwork sale on March 25, 2017 by Yami. I told my daughter to create an Instagram account for me so I could follow her and like her posts. I have a few concerns though. Besides the regular photos to post, I don’t have a decent profile picture to use. My daughter said I don’t have to worry about pictures to use; the important thing is that I have an account and I could now follow my friends and relatives. Also, it would be easier to check on guitar center stores near me. This entry was posted in Music, Social networking site and tagged instagram on March 10, 2017 by Yami. My daughter was happy when she sent me this illustration through viber. This was posted on candymagdotcom Instagram. Link here. She’s happy that her favorite author and artist Abbey Sy liked the post. N had her second internship at Candy Magazine. 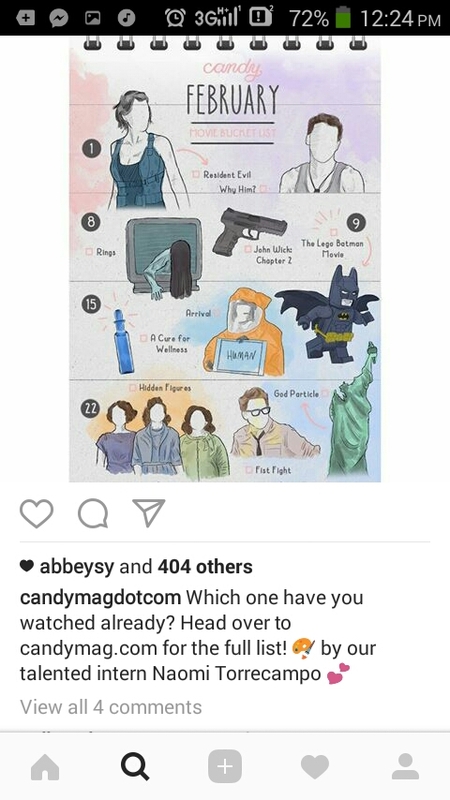 This entry was posted in Artwork, Career in Art, College life, Digital Art, Entertainment, Job Opportunities and tagged candmagdotcom, candy February movie bucketlist, candy mag illustration, Candy Magazine, candymagdotcom instagram, intern, internship on March 1, 2017 by Yami.